According to a new study conducted by American and Czech researchers, the trade of code-signing certificates is a flourishing business. Code-signing certificates are precious commodities in the dark web, according to a new study conducted by American and Czech researchers and Symantec Labs technical director Christopher Gates their trade is a flourishing business. The experts pointed out that the demand for code-signing certificates is increased because vxers have started using them to bypass security solutions such as Microsoft’s Windows Defender SmartScreen. “While prior studies have reported the use of code-signing certificates that had been compromised or obtained directly from legitimate Certification Authorities, we observe that, in 2017, these methods have become secondary to purchasing certificates from underground vendors.” states the research paper published by the experts. and dozens of websites treating black market goods. They identified four leading vendors of code-signing certificates, one of them named Codesigning Guru set up his own e-shop in August 2017. The researchers regularly collected stock information in a 104 day-period and analyzed the sales. The e-shop obtained a new certificate every two days, on average, and collected $16,150 in revenue for selling these certificates. A new codesigning certificate generally trades for a few hundred dollars. Extended Validation (EV) code-signing certificates can also be purchased for a few thousand dollars each, sellers provide the 2FA hardware tokens they are bound to them being shipped by post. Microsoft Defender SmartScreen is a reputation-based system, every time encounters a certificate for the first time, it will raise a warning the user has to click-through during installation. To avoid warning being displayed the attackers need a positive reputation for the certificate, this could be obtained by first using it to sign benign programs and installing them on many client machines. The price for Extended Validation code-signing certificates is higher because they came with a positive SmartScreen reputation. The prices for EV certificates range from $1,600 up to $7,000 for certificates with the best SmartScreen reputation. “EV certificates are much more expensive. Earlier posts by vendor C list the price of $1600 while more up-to-date posts by the same vendor C offer EV certificates for $3000. Vendor B sells EV certificates for $2500 (both in the forums and in the Codesigning Guru e-shop).” continues the paper. 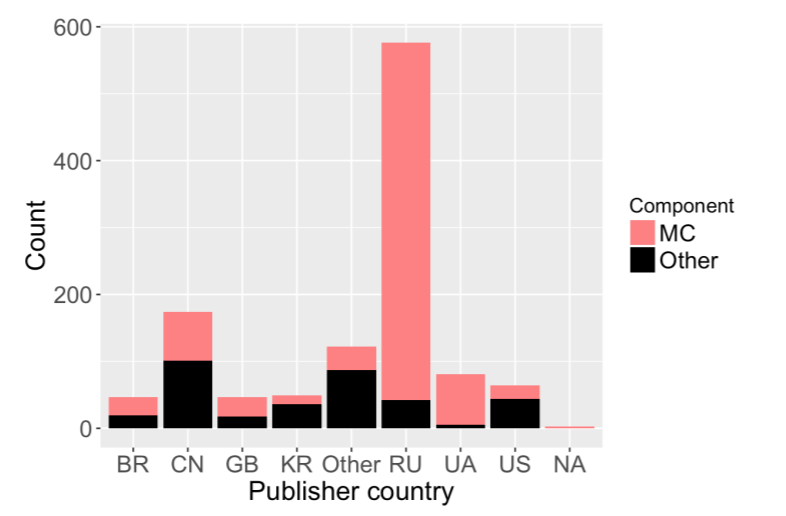 The researchers also analyzed the publishers noted in the certificates using the beta version of the British public register of companies and the result was suspicious. The doubt is that some companies were set up specifically for certificate abuse. “All of the publishers were rather young companies, some of them being incorporated around a month before their code-signing certificate was issued and most of those did not have software development as their primary focus.” continues the paper. Researchers noticed that most of the activity was originated in Russia. Certificate Authorities have to vet applicants with care and once a malicious publisher is identified all certificates from that publisher should be revoked.